THE WRITING BUDDHA - Opinions | Books | Movies: That Man in the Mirror by Rajeev Ranjan (Book Review- 3.75*/5) !!! 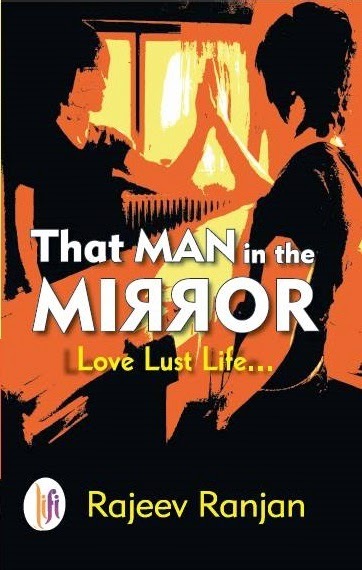 That Man in the Mirror by Rajeev Ranjan (Book Review- 3.75*/5) !!! I am done reading "That Man in the Mirror" written by Rajeev Ranjan in a single sitting. This is his 3rd book and I am happy to say that I have read the first two books by him. The first one was rated 3.5 by me and the 2nd one, 2.5. I am feeling better claiming that his 3rd book is better than both his attempts and his best book till date. The synopsis itself represents that the book is an intense attempt and I wanted to see if author has justified the promise or not. But right from the first page to last, whatever emotion Rajeev wanted to depict reached perfectly to the readers. The language used by Rajeev is very easy-going and his command over English has just improved vastly since his last book. The narration used for this story is perfect. I liked the author's approach of telling a story purely without inserting and sharing useless conversations every now and then. Every chapter begins with a philosophical tune which adds more substance in the story. I liked the way author questions us about certain situations that we face in our life and then goes on showing what the protagonist did against the given situation. There are times when you want to hit the protagonist for his decision but the way author narrates the whole thing asks you to believe in his decision even when you know its purely wrong. That's the greatness in the writing style of Rajeev Ranjan in this book. Book starts with mainly discussing about the mentally-challenged brother of the protagonist and what happens with him later on is one of the best part. Then the lust part comes in and I started doubting the book but the way author gives it a dynamic turn and makes it the base of the intense story that runs later on only makes you love the book more than before. Another great part is the discussion of Suman's life even when she does not play any direct part in protagonist's plot. It gives a mature quotient to the story. Every emotion and situation is described as if author has written his autobiography. You do not find any falseness anywhere. Everything is so real that you would want to meet the main characters. The pre-climax and climax is so well-handled that it raises the book to yet another level. In the end, when the book gets over, you will yourself go, stand in front of the mirror and cry like hell remembering all the hidden wrongs you did against your closed ones but never confessed. When I found myself in THAT MAN IN THE MIRROR after finishing the book, I felt so proud of the author that I have already started waiting for his next book. I give this one 3.75* out of 5. The few drawbacks are:- I found book 30-40 pages more lengthy. Author repeats the same sentences many a times to give a scene more intense which becomes boring sometimes. The repetitiveness is the biggest flaw in this book which also resulted in this book's thickness. That's all!